Windows 8 has just arrived and you must can't wait to upgrade to the newest Window operating system to have a better experience in using your PC. If you're using Windows 8 and want to burn videos in AVI, WMV, MP4, MOV, MKV, FLV, 3GP, ASF, VOB, M2TS, MPEG, etc. formats to DVD for playing on your home DVD player or TV, look no further! Here we'll show you how to burn DVD in Windows 8 with an intuitive DVD burner for Windows 8. Part 2. Which Kind of DVD Disc Should We Use to Burn DVD? On the main interface, click "Import" to add the video files you want to burn to DVD disc. You can preview the added videos, organize video sequence, etc. when the files are loaded. Before burning the videos, you can crop, trim, adjust effects, add watermarks, rotate, etc. 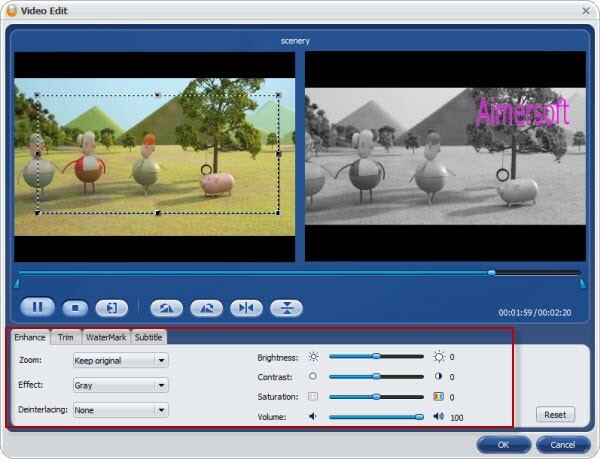 to customize your videos in the Video Edit window by selecting a video clip and choosing Edit. Next, go to Menu tab and select a DVD menu from the template list. You can then customize the DVD menu with your favorite pictures, music, buttons, frames, etc. And if you don't want the menu, simply choose "No Menu" to skip the menu. When all the settings are OK, click Burn and follow the instructions to insert a blank DVD disc, define the burning settings to start burning your videos to DVD in Windows 8. You can also save the files to ISO image file or DVD folder for burning later. Burning DVD movies has just become another enjoyable hobby for a lot of people. However, this simple task can be a little frustrating to some. Not everyone knows that a particular kind of DVD is required for every media player and burning device used. To know which DVD is ideal with your device, it is first important to learn about the types of DVDs available. Generally speaking, there are about four kinds of DVD discs sold in the market today. These are the DVD -R, -RW, +R, and +RW. These disks all look the same, but they function not in the same. The DVD drive attached to your computer is normally labeled with the type of discs that it can work with. If the DVD drive says DVD +R, then it will play +R discs, but not necessarily the -R ones. The same goes for the DVD -R drive. Be very careful about using +R discs with it as they may not be readable by the device. Furthermore, the W in +RW and -RW indicates the DVD drive is writable. So unless it says +RW or -RW in the drive, you can’t burn DVDs with it. DVD +R and -R can only play discs, not burn them. In order for you to successfully burn DVD discs, be sure that it says DVD +RW or DVD -RW in the device, and install the necessary burning software for it. List down the specifications of your DVD drive before you go to a store so you’ll end up buying the right discs. Look for discs that perfectly matches the requirements and specifications of the drive. If you will also notice, the speed of the DVD drive is also indicated on its body. Find discs that will match that specification as well. For example, if your DVD drive says 32x +RW, then look for a DVD disc that works in that particular speed. Convert TRP to DVD: Looking for an efficient way to burn TRP video files to DVD? This article recommends you the ideal solution. Convert RMVB to DVD: This tutorial shows you the simple steps for burning RMVB video clips to DVD. Burn Vimeo to DVD: Have downloaded many videos from Vimeo and want to burn the files to DVD? Follow the steps here. Convert DVR-MS to DVD: How to burn DVD-MS to a DVD disc? This articles introduces you the easiest and fastest way. Burn Dual Layer DVD: Dual layer DVD can hold more content than standard DVD. Follow the tutorial to learn how to burn dual layer DVD with ease. Burn BBC iPlayer to DVD: This article teaches you the most efficient way to burn videos downloaded from BBC iPlayer to DVD. Burn iPhone Video to DVD: Having shot videos with iPhone and want to burn them to DVD to share with family and friends? Find the ideal solution here. Burn Netflix to DVD: Have the need to burn videos from Netflix to DVD to watch on TV? Follow the tutorial right now! Convert VLC to DVD: The article teaches you how to convert VLC media files to DVD easily and quickly. Music Video to DVD: How to burn music videos to DVD without any hassle? This article shows you the easiest steps.